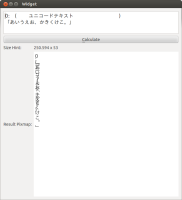 It would be useful if Qt had support for vertical text writing which is common in many Asian languages. Traditionally (and still very common today) Chinese, Japanese and Korean were written vertically. This is not yet possible with Qt. Also, some characters look slightly different when written vertically, e.g. 、。「っ and so on. I think, this is done via the "vert" substitution table in the fonts. Vertical writing is also extremely necessary for Mongolian, which can only be written vertically. In this, the writing differs a little bit from CJK writing, because it starts at the upper left corner. All in all, this is really a necessary feature.